The following images show some of the vessels used on Sydney Harbour since 1900. Many of the images are colour tinted as was the practice in Edwardian days. In common with the Sydney Harbour Bridge and the Opera House the ferries that ply the harbour are iconic symbols of Sydney. Most tourists manage a trip on a ferry usually to Manly or the Zoo. Ferries predate both land-bound icons by many years and were once a key means of transport linking North Sydney and the City. Sydney now has a large fleet of ferries, some 30 in all, operated by Sydney Ferries. The ferries link Circular Quay at the northern end of the city centre with points on the lower North Shore, to the west along Parramatta River and to Manly. Today some 36 peak hour trips are run by Sydney Ferries. The ferry companies were once privately operated and progressively came into public ownership from 1951 onwards. 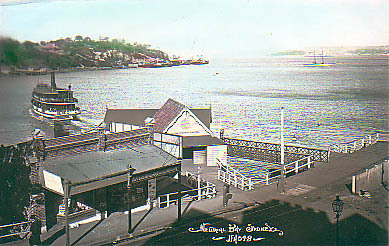 During the Government Tramway era the ferries connected with trams at numerous points around the harbour. The most impressive ferry/tram interchange by far was located at Milsons Point. During peak times prior to the opening of the Sydney Harbour Bridge ferries departed Milsons Point every six minutes. The ferries used on this run were high capacity vessels capable of carrying loads of 2,000 passengers. (About the equivalent of 9 full tramcar loads – O class double sets). Ferry technology has developed over several generations and the mass passenger loadings experienced during the inter-war years prior to the opening of the Sydney Harbour Bridge in 1932 were serviced by vessels designed for rapid turnaround and high capacity. Multiple entrances/exits and double ended propellers ensured rapid loading and unloading at wharves.